Abstract: A horse was presented for poor athletic performance after a trailering accident. Examination revealed lameness in the left rear leg due to sacroiliac joint injury with subluxation. Weekly treatments included dry need acupuncture, electroacupunture, and low level laser therapy for 3 weeks. Both lameness and subluxation resolved and horse was returned to normal use in 3 months. History and presentation: “Major” is an 11 year old Quarter Horse gelding used for barrel racing. On April 30, 2017 he was involved in a trailering accident that resulted in him being dorsally recumbent in the trailer. The owners found no visible injuries due to the accident and continued to ride the horse at barrel/pole events on May 6 and May 13. However, the owner found that the horse did not perform as well, was slower, and seemed uncomfortable in the rear legs. I have been Majors primary care veterinarian for over 2 years and see him for routine soundness checkups every 1-2 months during show season. His relevant medical history includes right side neck pain, right extensor carpi radialis muscle injury, and left longissumus dorsi muscle pain in the lumbar region. There is no history of lameness in the rear legs or abnormalities in the region of the croup. Physical Exam and Clinical Assessment: On May 15, 2017 a lameness exam revealed a grade 2/5 lameness on the left rear leg at a trot. There was no external swellings or injuries visible on the leg. Response to hoof testers was negative. Flexion test of left rear fetlock was negative. Flexion test of left rear hock/stifle was mildly positive. The horse shifted weight between rear legs every 5-10 seconds while at rest. The left tuber sacrale was elevated approximately ¼ inch higher than the right tuber sacrale. No deficits were noted in the neurological exam. The diagnostic acupuncture exam revealed bilateral sensitivity in the inner bladder lines beginning at BL23 and extending to BL30. Pain responses were also noted on the left side at GB27 and GB29. Upon manual compression of the dorsal aspects of the tuber sacrale, the horse responded by buckling both rear legs and nearly collapsing. The left gracilis muscle would fasciculate when the left rear leg was placed in full extension. Differential Diagnoses: Possible diagnoses considered for this case included conditions due to traumatic injury to structures in the lumbosacral region, pelvis, and sacroiliac joints: muscle/soft tissue injury (supraspinous ligament, longissimus dorsi m., middle gluteal m., deep gluteal m., and superficial gluteal m.), fractures/stress fractures (wing of sacrum, tuber sacrale, tuber coxae, wing of ilium), and sacroiliac joint injury (subluxation, dorsal sacroiliac ligament). Putative Diagnosis: The owners chose to not pursue diagnostic imaging or local analgesia techniques. A putative diagnosis of acute left sacroiliac injury with subluxation was made based on the left tuber sacrale being elevated and the horse exhibiting a dramatically positive response to compression of the dorsal aspects of the tuber sacrale. Medical Decision Making: The targets for needle placement were the muscles, nerves, and fascia in the lumbosacral and sacral areas. Muscles included longissiumus dorsi, gluteal muscles (middle, superficial, deep), and biceps femoris. The sciatic nerve (exiting intervertebral foramina of L5, L6, S1, and S2) was important since it supplies 50% of the muscles of the hind limbs. Both cranial and caudal gluteal nerves were targeted since they innervate the gluteal muscles. Neuromodulation of thoracolumbar spinal, mid and caudal lumbar spinal, and S1-S4 spinal nerves is important to positively affect pain and function in this area. Laser therapy was also chosen to be applied in the region to decrease soft tissue inflammation, promote healing, and decrease pain. 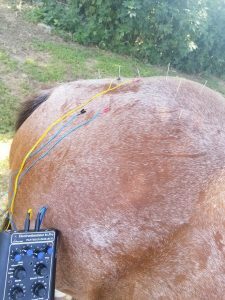 Acupuncture Treatments: The horse was treated for 3 treatments (May 15, 22, and 30, 2017). Each acupuncture session began with placing Seirin .30X40mm acupuncture needles at GB21, LI16, and Bai Hui to relax the horse. Needles were placed bilaterally at BL23, BL25, BL26, BL27, BL28, BL29, and BL30 to neuromodulate the lumbar and sacral spinal nerve segments. Electroacupuncture was applied to BL23-BL30 using mixed frequency of 2Hz and 100Hz for 20 minutes. A myofascial trigger point at GB29 was dry needled with a Seirin .30X40mm. Distal points BL40, BL67, GB44, and SI3 were dry needled using Hwato .20X13mm acupuncture needles. LLLT was applied for 3 minutes lateral to each tuber sacrale in a scanning movement using a 200mw 810nm probe set at 2.5Hz. The owners were advised to stretch the left rear leg back and hold for 30 seconds. Then after a short rest period, stretch the right rear leg forward and hold for 30 seconds. It was recommended to perform the stretches 3 times daily. Outcomes, Discussion, and References: Upon reexamination for the second acupuncture session (5/22/17), the left rear lameness had improved from a grade 2/5 to grade 1/5. The left tuber sacrale was observed to be only slightly higher (approximately 1/8 inch) than the right. Sensitivity to compression of the dorsal aspects of the tuber sacrale had improved 50%. The left gracilis muscle would no longer fasciculate when leg placed in full extension. Reexamination during the 3rd acupuncture session (5/30/17) revealed very slight lameness only visible at a trot in a tight left circle. The left tuber sacrale was no longer elevated higher than the right. Some sensitivity to compression remained over the tuber sacrale but overall improvement was at least 80%. This horse received no anti-inflammatory medication (even though it was recommended) or other therapy during the 3 weeks of acupuncture treatment. He remained turned out in a large pasture during and for 3 months after treatment. The horse was examined on September 5, 2017 and no lameness, myofascial sensitivity, or asymmetry in hind end was found. It was recommended the horse not be used in speed events for another 3 months and be exercised to maintain body condition. Owners chose to return Major to barrel racing and as of this date he is at preinjury level performance.